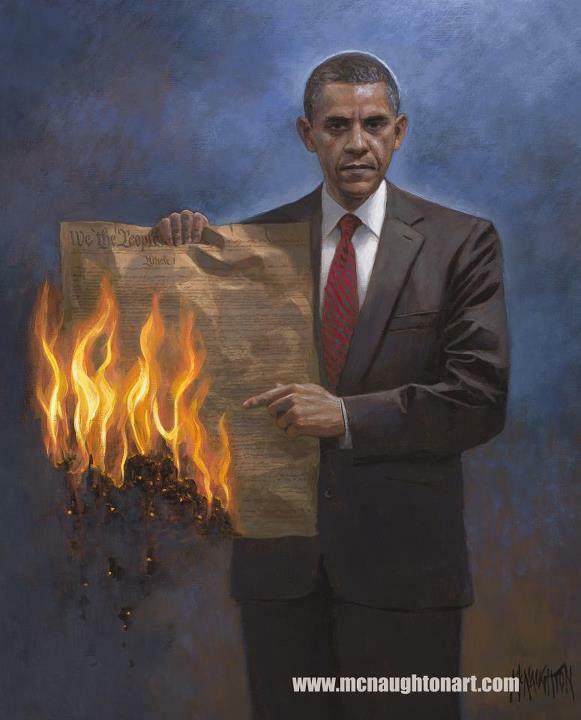 The joy, of course, is in the little details in the painting; the copy of the Constitution that Obama’s standing on, the placement and expression of each of the presidents. It’s a painting you could get meaning out of for hours. 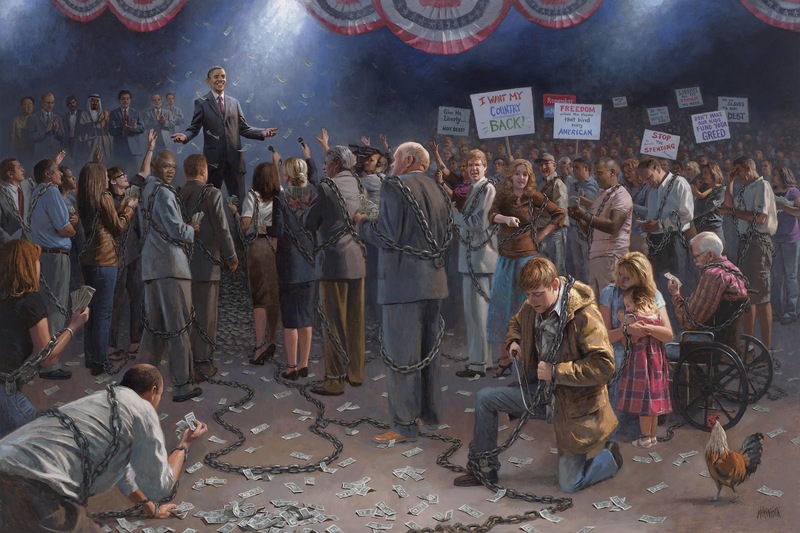 But don’t spend too many hours looking, becauseÂ McNaughton has come out with a second painting, labelled, “Wake up America” which is even more awesomely, blatantly Tea Party. Â Here IT is, below, or viewable in detail onÂ McNaughton’s website. What do you think dear readers? Â Any more examples of liberty in paintings or other fine art? Â How many of you visit the excellent online storefront of Quent CordairÂ for your fix of Objectivist inspired fine art? 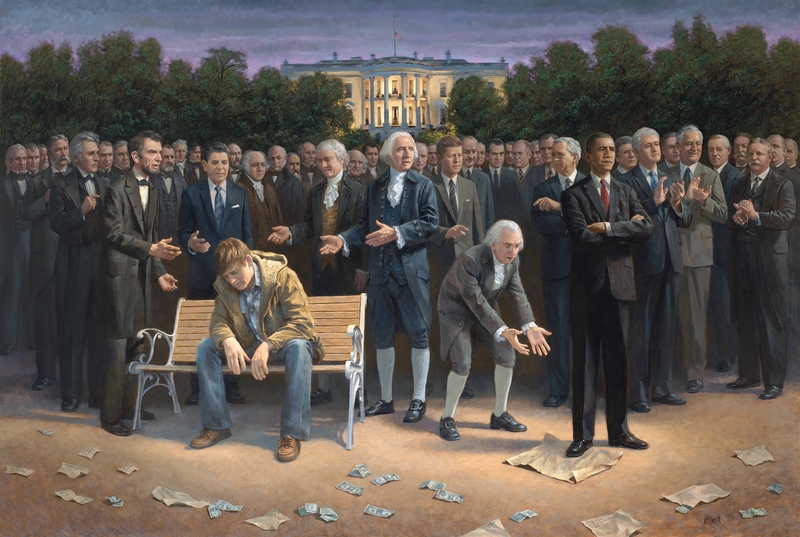 McNaughton has recently released a third painting, called “One Nation Under Socialism.” Â See it below, or at the artist’s website. I don’t know that he’s incorporated his politics into his art, but John Currin, one of the more prominent contemporary American painters, is a libertarian. The New York Times did a write-up mentioning his and his sculptor wife, Rachel Feinstein’s, politics — along with their penchant for dressing sharply and living well. These paintings are what you’d get if Maoist propganda posters mated with Jehovah’s Witness pamplhlet illustrations: shallow, simple-minded, preaching to the choir. You’re right luvdomus, I’d hate to be associated with a group that used shallow, Maoist propaganda posters to advance their agenda. Is it not interesting how Mr. Luv is willing to throw his Maoist brethren under the bus when it suits his benefactor’s socialist agenda? I love this man’s art and I have very much enjoyed perusing your site as well, young man!